Our very popular kickboxing / conditioning class has created a buzz in the Lower Mainland for it’s tough, yet fun workout! Bootcamp / strength / conditioning meets kickboxing in this exciting 60 min workout that is available 5x a week! Come down for a FREE trial lesson and see what everybody is talking about. We guarantee an excellent workout with a positive approach in fitness training. Here is what the Vancouver Sun had to say! It’s kickboxing, but not as you may know it. From the moment you bow (before stepping into the dojo, the Japanese for martial arts training place); bow to your instructors (before addressing them as sir); and stand to attention (before starting the class); you quickly understand that discipline is at the heart of the workout by former pro international mixed martial arts fighter, Chris Franco. There is, however, lots of fun during the hour long classes. 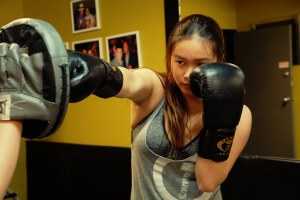 With accompanying adrenaline arousing music, you power through a series of boxing and kickboxing routines (sometimes on your own “shadowing”, sometimes with you and your partner both padded up), as well as sweat-guaranteeing cardio moves that live up to his mantra that “No Man or Machine Will Train You Better”. Far from a new-fangled workout the dojo also features some Pankration techniques, a blend of Boxing and Wrestling first introduced at the Greek Olympic Games in 648 BC. Who does it suit? Those who like to be a part of community – or simply want to punch out after a bad day. Available for both Men, Women, & Teens.